The United States says it will withhold $800 million in military assistance to Pakistan. 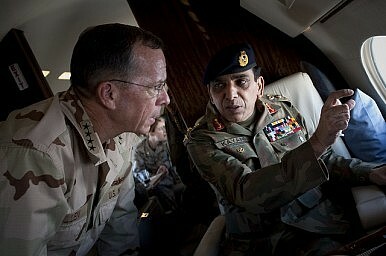 After Adm. Mike Mullen's forthright statement about the likely involvement of the ISI in the killing of Saleem Shahzad, the crusading Pakistani journalist, the United States has now chosen to withhold $800 million of some $2 billion in military assistance to Pakistan. The stated reason is that the Pakistani regime has been less than forthcoming in issuing visas to US counterinsurgency trainers for Pakistan. This hiatus in aid is designed to concentrate the minds of Pakistan's military brass, who have long been reluctant to take on elements of the Pakistani Taliban, and have resorted to deft verbal sleights of hand to justify their lack of cooperation. Of course, apologists for Pakistan have immediately issued dire warnings about this decision to defer aid until the military proves to be more receptive to American concerns. Some have suggested that it will erode trust, while others have raised the perennial bogey about China stepping into the breach. Both of these arguments are flawed. The paucity of trust is nothing new, it's simply that some policymakers in Washington have finally tired of Pakistan's many prevarications and have decided to display some gumption. Of course, the dire state of the country's finances has also reduced the appetite for military assistance to a dubious ally. The China card is equally specious. China is in no position to supply the weaponry or the training that is suited for counter-insurgency operations. They don't manufacture the appropriate helicopters, night vision equipment or small arms needed for counterinsurgency operations. The less said the better about the PLA's counterinsurgency capabilities. What now remains to be seen is if policymakers in Washington have the requisite fortitude to follow through on this initial and welcome decision to hold the recalcitrant Pakistani military to account.